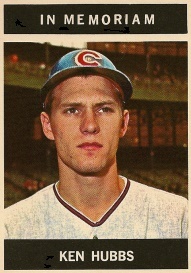 As a 20 year-old playing for the Chicago Cubs in 1962, Ken Hubbs hit .260/.299/.346 with five home runs and led the league, unhappily, in strikeouts and grounding into double plays. Ken, however, let his glove do the talking and ended up setting Major League records for consecutive errorless games (78) and chances (418) at second base that season. For his efforts, Hubbs was named National League Rookie of the Year and awarded the Gold Glove. In 1963, Hubbs regressed and hit only .235/.285/.322; however, he was able to cut his strikeouts by 27% and otherwise put together another nice season patrolling second base for the Cubs. As spring training 1964 approached, Hubbs was enjoying the last couple weeks of the off-season by participating in a basketball tournament in Utah. Two weeks prior, Hubbs had obtained his pilot’s license and he and a friend, Dennis Doyle, flew from Colton, California to the tournament in Hubbs’ single-engine Cessna 172. On February 13, 1964, Hubbs was prepared to leave Utah for the flight back to Colton. He was cleared for takeoff at 10:00 a.m. in snowy conditions with poor visibility. Unfortunately, Hubbs and Doyle never made it home, his plane crashing into ice-covered Utah Lake, near Provo. The bodies of Hubbs and Doyle were recovered by divers after the crash site was located by rescue workers. The investigation of the crash showed that the plane hit the icy lake surface at a 70° to 80° angle, with the right wing making first impact. The investigator deemed this a “graveyard spiral” typically caused when a pilot loses sight of the horizon in bad weather. Too young, Hubbs and Doyle were taken. For their 1964 set, Topps issued the “In Memoriam” card for Hubbs, seen here. Thanks for the article! Kenny was my cousin. I was 5 years of age when he was killed but I remember him like it was yesterday. Ernie Banks summed up well the legacy of Kenneth Douglas Hubbs. In 1964, soon after Kens death, the city fathers of his home town, Colton CA, began the Ken Hubbs Foundation to perpetuate his legacy . The Foundation is a 501 3 C charitable corporation now entering its 54th year. On an annual basis, beginning with 4 schools in the San Bernardino, CA area of the old Citrus Belt League in which Ken Played – lettering in 4 sports – Football, Basketball, Baseball and Track (High School All-American in Football and Basketball in the same year) the Foundation presently honors top athletes from 25 schools including both boys and girls. From among those 50 athletes an overall winner is chosen – one girl and one boy. In 1977 Ronnie Lott was the overall boy winner from Eisenhower High in Rialto CA. The Foundation’s Award’s Banquet will be held on Monday, May 14, 2018 in the Bloomington (CA) High School Multiple Purpose Room beginning at 6:00 PM – 400 people attended in 2017 – donation requested. I had the pleasure to play varsity baseball as a senior with Ken Hubbs a freshman. Ken was an exceptional athlete and an exceptional person. It was a sad day when the news came that he had died in his plane along with one of my college roommates, Dennis Doyle. Ken’s older brother, Keith Hubbs was also an All-American High School Football Player from Colton High and played on the same high school baseball team as a senior.. There is a Little League Baseball Field named for Ken Hubbs in Colton CA. i was nineteen and avid baseball fan of the san francisco giants when the news came out about ken hubbs it was so sad because no one will ever know what he would have done had he he a long career sad story.